"Because he's Black as well as of Islamic origin, when Obama declared himself a candidate for the U.S. Democratic nomination, some of us thought American politics would change … we were very disappointed by Mr. Obama's declaration regarding the Arab-Israeli conflict and Jerusalem. … We must launch a serious organized campaign to alter Obama's position." Because he is Black and of Islamic origin, when Obama declared himself a candidate for the U.S. Democratic nomination against Hillary Clinton, some of us thought that perhaps American politics would change, resulting in a more equitable approach to the Arab cause, the Palestinian issue and the historic oppression of the Palestinian people, whose homeland was stolen and who have been scattered to the four corners of the earth. Because it's so rare for someone of mixed race to go this far in American politics, we were very disappointed by Mr. Obama's declaration regarding the Arab-Israeli conflict and Jerusalem, which is the most sensitive issue in terms of reaching a final solution with the Zionist enemy. 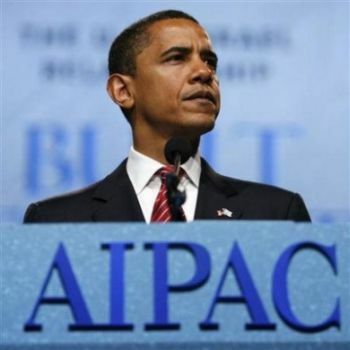 Mr. Obama made these declarations while presenting his credentials to “AIPAC,” the American-Jewish lobby known for its staunch support for the Zionist entity. Talk by American leaders of freedom and human rights quickly vanishes when it comes to Israel. Behind the vulgar and stereotypical positions of U.S. leaders is the electoral influence of American Jews and the money they wield in supporting election campaigns. This goes unmentioned by the major media outlets, most of which are owned by supporters of Zionism - both in their thinking and their loyalties. Early on in his remarks, Obama revealed his ugly side with respect to our people and our national cause. All of his subsequent comments on settlements and the creation of a Palestinian state will do nothing to restore his image amongst Palestinians. When Obama takes the reigns of U.S. policy at the White House, America's unlimited support for the Zionist entity will remain. All the recent talk about the declining importance of Israel's role in American interests will not alter this fact. We won't here enter into matters of religious associations and the legendary views of America's Christian sects about the Jewish State in Palestine. But in this context, what must be understood is that these beliefs emerged out of generations of lies and fabrications conceived of to harness the influence of Christian groups for the purpose of preserving the sanctity of the Jewish state, which these groups consider the living embodiment of the will of God. In order to win our battle against these ideas and expose the racist face of the enemy for what it is to Obama and others, we must engage in cultural activities that focus on civil and non-governmental organizations that have direct contact with American society, especially since there are millions of Arabs and Muslims that reside there and carry American citizenship. And secondly, we must lobby on an official level, particularly on the economic front in areas where the interests of Arabs and Americans are superior to those shared by America and Israel. In any case, “God helps those who help themselves.” We must roll up our sleeves and minds and launch a serious, organized campaign to alter Obama’s position, even if some people tell us that his statements are regularly repeated and only represent electoral propaganda that the candidate will quickly retreat from when he reaches the presidency. And since there is a strong possibility that the Republicans will continue on in the White House under Republican candidate John McCain, which will ensure the survival of an American policy that continues with its distorted perception of our issues and lopsided support for the Zionist entity, the task ahead will likely be more daunting and complex. Obama's attitude is no different that those of other American politicians aspiring for the presidency, and such attitudes show every sign of remaining for some time to come. When will we set aside our delusions and dreams about the friendly American and the possibility that he will deal fairly with our long-usurped rights? And will it be possible for us to reverse our flagging fortunes, preserve our nation's dignity and protect its interests?